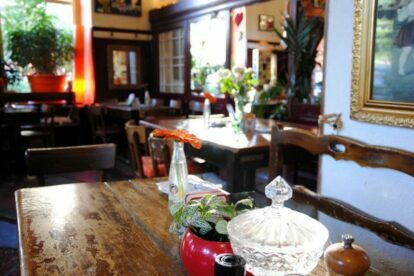 Hidden in a bit of a rough and unknown part of the second district, you can dive deep into the bohemian cuisine. Nordpol – a quite unusual restaurant with quite an unusual address (the small alley is called “at the north pole”). Let alone the unusual paintings and the interior: kitsch, trash, hokum – you may call it as you like, but it definitely is a cozy place. The best thing you can do is to keep yourself on a diet for the day, and arrive with an empty stomach and a hunger like that of a bohemian woodcutter! Why, you may ask?! Because goulash, meat loaf and dumplings the size of Texas are not really light fare. Nevertheless, it’s worth the fight. And not only will the meat lover be in heaven! Even as a vegetarian, like I am, you will love the homemade gnocchi style dishes, the Russian blinis or the gorgeous desserts like pancakes and sweet plum dumplings. But be warned, this place is always crowded, so be early or you’ll have to wait a long time to get a table (and at the north pole there is really nothing else close by). Always advisable to phone and reserve a table.